It’s hard to say! It all depends on your specific T-shirts. 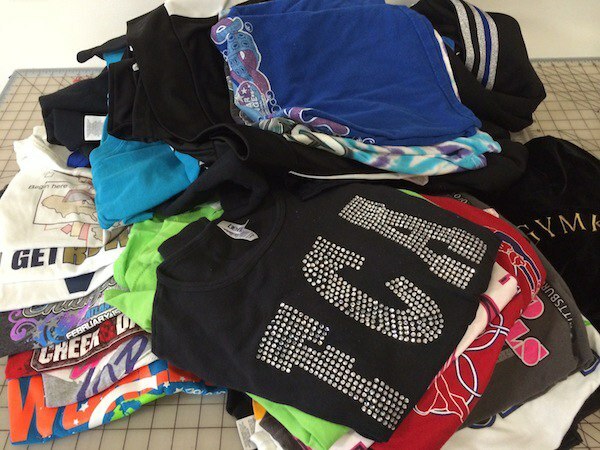 The list here is only an approximation of the number of T-shirts, sweatshirts or other clothing items it may take to make a quilt of that size. You may need more T-shirts if the designs on your T-shirts are small. Or you may need fewer if the designs on your T-shirts are big. Count each T-shirt you have as one, whether it has a design just on the front or a design on the front and back. The more T-shirts you have with fronts and backs means you will need to be on the lower end on the approximate number needed. If you have T-shirts with small designs on just one side, you will need more T-shirts. Generally, we take the T-shirts you send us and cut them. Then we determine what size quilt those T-shirts could make. We will e-mail you and tell you the dimensions of the quilt that these T-shirts can make. At this time you can accept the dimensions of the quilt or you can add or remove T-shirts so the quilt is the size you would like. The size of your quilt is based on the size blocks we begin with. 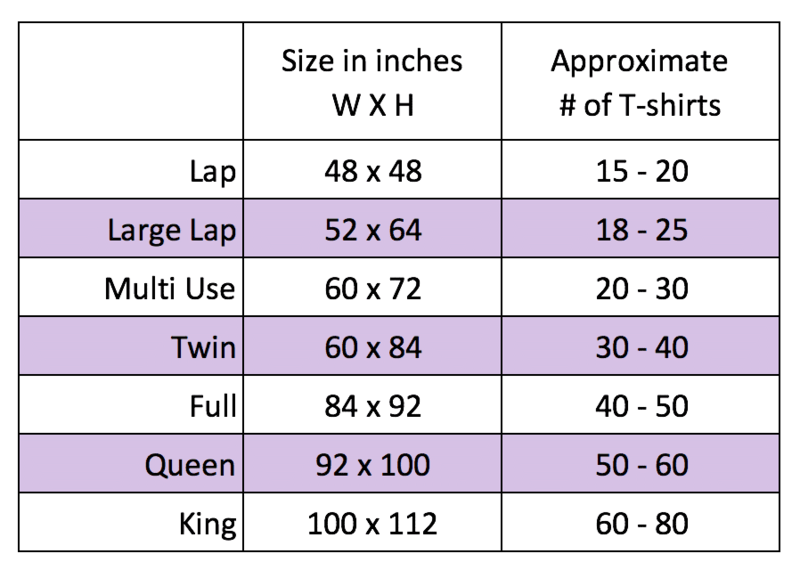 The actual size of your quilt can vary depending on your T-shirts. Some quilts end up larger, some smaller and other the exact size. T-shirts are stretchy. The amount stretch or lack of stretch will effect the final size of your quilt. 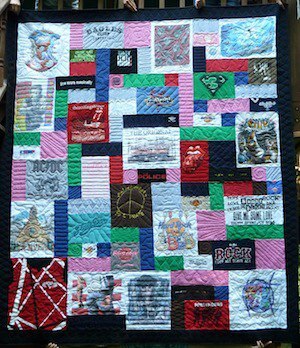 We can make your quilt whatever size your T-shirts will allow. So, you might have a quilt that is in between standard sizes. Whatever size your quilt is, the size will be divisible by four. Concert T-shirts tend to have large designs on the front and backs of them. They almost go two to one of typical T-shirts. Keep this in mind when you are counting out your T-shirts. When you have a lot of T-shirts and only want a small quilt, you will need to make some choices. If you know ahead of time that you might have too many T-shirts for the size quilt you are looking for, you can do a few things. 1. Pack your T-shirts into sets. The first set would be the T-shirts that must go into the quilt. The second grouping would be T-shirts that we can cut from if we need to make your quilt larger. 2. Keep a list of the T-shirts you send so if necessary, you can tell us what to remove. Do you need to make your T-shirts go further? You have a few options. 1. We can cut your T-shirts “big”. This means that there is more space around the design than we would normally cut. If you think that we need to cut your T-shirts big, let us know before we begin cutting. 2. 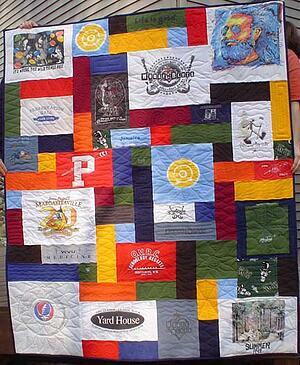 We can also make your quilt larger by adding squares of bright colored T-shirt material. In the two quilts below, we were short on T-shirts to make the quilt the right size. 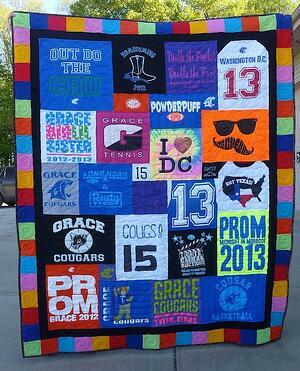 So we extended each T-shirt quilt with colored squares of T-shirt material. 3. A border can be added around the quilt to make the quilt larger. Here is a link to our border page for more information. 4. A border and extra block combination is also possible.